The Blanco County Courthouse of 1916 was the first permanent courthouse built after the county seat moved to Johnson City in 1890. 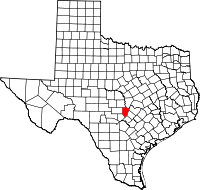 Blanco County is a county located on the Edwards Plateau in the U.S. state of Texas. As of the 2010 census, the population was 10,497. Its county seat is Johnson City. The county is named for the Blanco River which traverses the county. The State of Texas formed Blanco County in 1858 from portions of Burnet, Comal, Gillespie and Hays counties. The city of Blanco served as the county seat from 1858 to 1890, when it was moved to Johnson City. 1150 AD Indigenous peoples first inhabitants, possible ancestors of the Lipan Apache. 1721 José de Azlor y Virto de Vera names the Blanco River. 1826 Benjamin Milam is given a contract to settle 300 families between the Colorado and Guadalupe rivers. 1836 Comanches claim all land in Blanco County. 1850s Samuel Ealy Johnson, Sr., grandfather of President Lyndon B. Johnson, and his brother Jesse Thomas Johnson, set up a cattle business in Johnson City. The town is named after their nephew James Polk Johnson. The Johnson family emigrated from Alabama. 1854-1855 Captain James Hughes Callahan and Eli Clemens Hinds become Blanco's first white settlers. Joseph Bird establishes Birdtown, now Round Mountain. General John D. Pitts, Judge William S. Jones, Andrew M. Lindsay, James Hughes Callahan and F.W. Chandler charter the Pittsburgh Land Company. They purchase the league granted to Horace Eggleston by the government of Coahuila y Tejas in 1835 and lay out the town of Pittsburgh, Texas, named for General Pitts, across the river from the site of future Blanco. 1858, February 12 - Blanco County is formed from parts of Comal, Hays, Burnet and Gillespie, and is named for the Blanco River. County seat is also named Blanco. 1860 Population of 1218, includes 98 slaves. Settlers are mostly Anglo-Saxon Protestants hailing from Tennessee and Alabama. Agriculture and livestock are central to the economy. 1861 County votes against secession from the Union. 1862 Legislature establishes Kendall from part of Blanco southwestern border. Legislature in turn incorporates parts of Hays and Burnet into Blanco. 1885 Replacement of courthouse by limestone structure now known as “The Old Courthouse”. 1883 Blanco High School is chartered. 1891 Johnson City becomes the new county seat. 1910 Cotton becomes one of the county's most important crops. 1900-1930 County farmers diversify into peanuts, peaches, pecans, pears, plums, grapes, and figs. 1915 Samuel Ealy Johnson, Jr. and his wife Rebekah Baines Johnson, parents of President Lyndon Baines Johnson, move into their home in Johnson City with their five children, Lucia, Sam Houston, Josefa, Rebekah, and Lyndon Baines Johnson. 1929 More than 20,000 peach and pecan trees harvested in the county. 1933-1942 Civilian Conservation Corps public work relief program helps improve county parks and infrastructure. 1934 Blanco State Park opens. 1937 Lyndon Baines Johnson launches his first campaign for Congress from the east porch of the family's Johnson City home. 1938 LBJ becomes a fierce advocate for rural electrification. First light bulb turned on in rural Blanco County. 1960s Lyndon B. Johnson becomes Vice President of the United States and subsequently President of the United States. Tourism becomes an important industry. 1970 Pedernales Falls State Park opens to the public. As of the census of 2000, there were 8,418 people, 3,303 households, and 2,391 families residing in the county. The population density was 12 people per square mile (5/km²). There were 4,031 housing units at an average density of 6 per square mile (2/km²). The racial makeup of the county was 90.97% White, 0.74% Black or African American, 0.59% Native American, 0.19% Asian, 0.01% Pacific Islander, 5.88% from other races, and 1.62% from two or more races. 15.32% of the population were Hispanic or Latino of any race. There were 3,303 households out of which 30.40% had children under the age of 18 living with them, 61.50% were married couples living together, 7.20% had a female householder with no husband present, and 27.60% were non-families. 24.00% of all households were made up of individuals and 10.80% had someone living alone who was 65 years of age or older. The average household size was 2.50 and the average family size was 2.96. In the county, the population was spread out with 24.40% under the age of 18, 6.20% from 18 to 24, 25.60% from 25 to 44, 27.10% from 45 to 64, and 16.70% who were 65 years of age or older. The median age was 41 years. For every 100 females there were 97.70 males. For every 100 females age 18 and over, there were 94.90 males. The median income for a household in the county was $39,369, and the median income for a family was $45,382. Males had a median income of $31,717 versus $21,879 for females. The per capita income for the county was $19,721. About 8.10% of families and 11.20% of the population were below the poverty line, including 14.20% of those under age 18 and 9.80% of those age 65 or over. According to the U.S. Census Bureau, the county has a total area of 713 square miles (1,850 km2), of which 709 square miles (1,840 km2) is land and 4.2 square miles (11 km2) (0.6%) is water. Blanco County is located in the Hill Country of central Texas, west of Austin and north of San Antonio. Two significant rivers, the Blanco and the Pedernales, flow through the county. ^ a b c d e f g Ogilvie, Mary H; Leffler, John (2010-06-12). "Blanco County". Handbook of Texas Online. Texas State Historical Association. Retrieved 27 November 2010. ^ Kelley, Dayton (2010-06-15). "Samuel Ealy Johnson Sr". Handbook of Texas Online. Texas State Historical Association. Retrieved 27 November 2010. ^ "Round Mountain (Blanco Co)". Handbook of Texas Online. Texas State Historical Association. 2010-06-15. Retrieved 27 November 2010. ^ "Blanco County Courthouse". Texas Escapes. Texas Escapes - Blueprints For Travel, LL. Retrieved 27 November 2010. ^ "Johnson City, Tx". Texas Escapes. Texas Escapes - Blueprints For Travel, LLC. Retrieved 27 November 2010. ^ "Blanco Co Historical Markers". Fort Tours. Retrieved 27 November 2010. ^ "Blanco Co State Park". Texas Parks and Wildlife Dept. Retrieved 27 November 2010. ^ Caro, Robert A (1990). The Path to Power. Vintage. p. 400. ISBN 978-0-679-72945-7. ^ "C L Browning Ranch". C L Browning Ranch. Retrieved 27 November 2010. ^ "Pedernales Falls State Park". Texas Parks and Wildlife Dept. Retrieved 27 November 2010. Wikimedia Commons has media related to Blanco County, Texas.